It's so easy to create rusty metal effects in Photoshop with this free PSD mock-up file. Simply add your logo/text inside smart object, save and close to see the result. 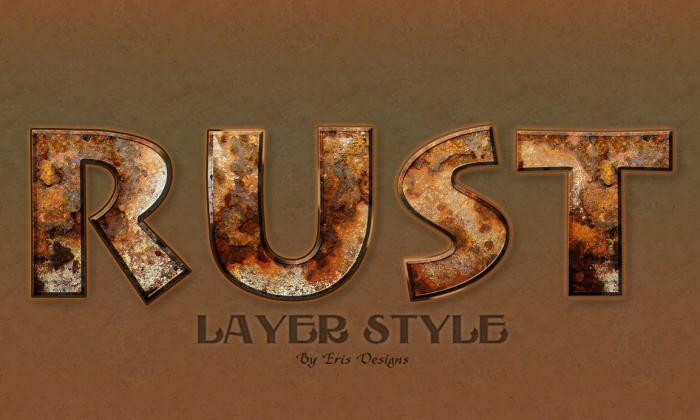 You can use any type of layers(text, shape, raster); the result is a grungy rusted metal effect that you can customize to you liking. Download this free rusty metal mockup and use it to create grunge logo effects with just 1 click. Easy to edit and customize, this PSD file comes fully layered with styles intact so you can pretty much change everything. Create grunge distressed metal effects in Photoshop using your logo. The logo is in separate layer(smart object) so you can easily move, rotate and resize it. You can also replace the rusty metal background with another texture. The font type used in this mockup is Intro - free font type. 1 comment(s) for "Rusty Metal Logo Free PSD Mockup"